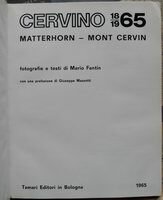 This is the first printing of the first edition of CERVINO 1865-1965 by Mario Fantin. This book was published in Bologna by Tamari Editori in 1965. 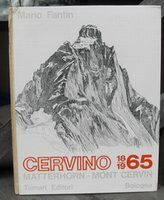 The book measures 283mm tall x 223mm and has 153 pages + , 77 b/w large photos, 5 b/w old engravings, 2 maps, 286 small b/w portrait photos of important Matterhorn climbers, 7-page Matterhorn book/articles bibliography (about 500 items). 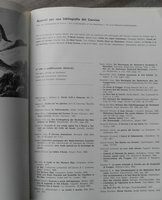 All of the text in this book has been equally translated into English and German keeping the text next to the original Italian text (including all photo captions). 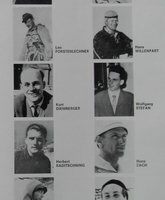 This excellent book documents the climbing history of the Matterhorn listing all the early attempts and ascents of every route on the mountain. The photos show every aspect of the mountain in great detail. 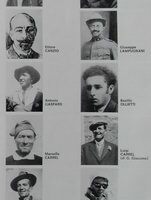 Routes are clearly marked on photos in the routes history section. 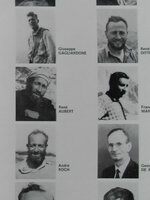 The section on climbers has portrait photos (in some cases sketches) of probably every important Matterhorn climber until time of publication. Named features of the routes and mountain are clearly indicated in the photos. Uncommon book that was probably a limited production in the first edition. CONDITION: Original glossy pictorial hardcover (probably no DJ ever issued by the publisher), paper covered imitation vellum spine with gilt lettering. 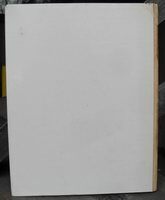 The spine of the cover has a repaired 13cm deep chip at the top (see photo). Otherwise the book is in near fine condition. 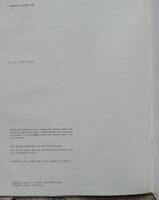 No previous owner marks or writing on any pages but there is a typo fixed in the printed date of the first ascent on page 98 (number 17 penned over with 14). 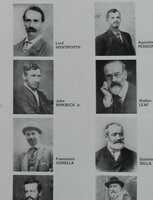 This was clearly a typographical error because the correct date of the first ascent is correctly printed throughout the book. No foxing, solid binding. The cover of this book is very prone to spine problems (splitting and chipping) and bumped/crunched corners. The spine material is fragile after aging. Price: $125.